You said yes to the dress! Congratulations! Now, about that waistline that’s just a little too snug or that length that is just a tad too long. Just because you found your dream dress doesn’t mean you won’t have to alter it at all. On the contrary, by altering your dress it’ll fit you perfectly and become even more of a custom creation. At Blue Bridal Boutique, we want you to feel beautiful on your wedding day, and this starts with making sure your dress fits just right. Come to our Denver location if you need alterations on your bridal gown! Brides are often surprised by the amount of money they’ll end up spending on alterations, but it’s a worthwhile cost to make your dress fit perfectly. There are different factors that contribute to the costs: the type of fabric, the magnitude of the changes, and the difficulty of the alterations, for example. You don’t have to be surprised by the cost when you know what to expect and can prepare for it ahead of time. Let’s say you buy your wedding gown a month or two later than you would have liked to make your purchase. Doing so may have a ripple effect that could mean your dress alterations may not be complete in time for the big day! Wedding dress alterations take time. You’ll want the professional working on your dress to have adequate time to do good work. It’s also important to be aware of when you go in for your first fitting and alteration appointment. If you go in too early, you will want to make sure to do another fitting closer to the wedding, otherwise, the dress may not be a proper fit the day of due to either weight gain or loss. 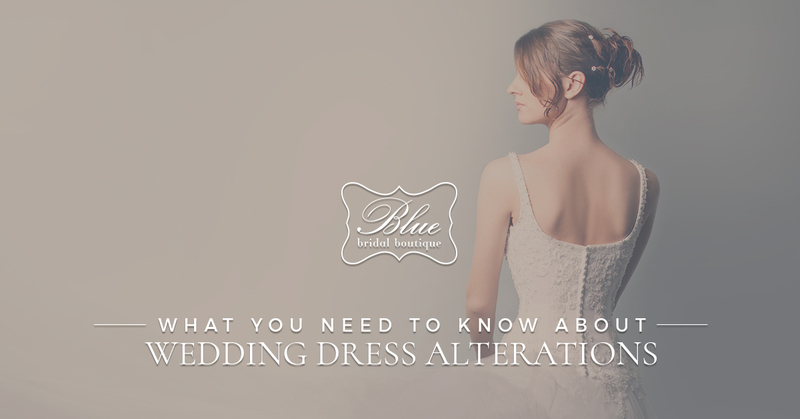 If you start your alterations too late, your dress may not be done in time. Speaking of weight gain or loss, let’s discuss how it works into dress alterations. You should never order a dress that’s too small as motivation for you to lose weight. There’s no way to know how much your weight will change before the big day — even if you work out regularly, drink kale and spinach smoothies! It’s always far easier to take a dress in than to let a smaller one out. You’ll be most beautiful when you’re happy and healthy, so do what it takes to get your arms toned and your waist just so, but don’t make it your sole focus. Are you wearing heels? How high? This can drastically change your height, so make sure you know what you’ll be wearing before cutting off an inch or two of fabric. Will you be walking on a hard or soft surface? Whether you’re having that magical outdoor wedding in the woods or you’re walking down a formal aisle on hard ground will also impact where the hemline of your dress should fall. We already mentioned bringing along your wedding shoes when you come in for a fitting, but it really is vital. If you don’t have the exact shoes yet, at least bring in shoes that you think will be around the same height. You should also bring in the undergarments and accessories you plan to wear on your wedding day. You can make sure your undergarments aren’t peeking out anywhere, see if you can squeeze some Spanx on underneath, make sure the length of your necklace or earrings are OK, and see how your crown or veil looks with the finished product. And, needless to say, bring along your mom or a friend. You’ll want someone there (besides us, of course) to help you through the process, encourage you, and be a sounding board. When you need dress alterations in Denver, Blue Bridal Boutique should be the first place that comes to mind. We keep you, your needs, and your wants in mind always. We’re aim to be not just your resource for incredible wedding dresses, but also for dress alterations. Keep checking our blog for more alteration resources. Reach out to us today and let’s do this wedding together!